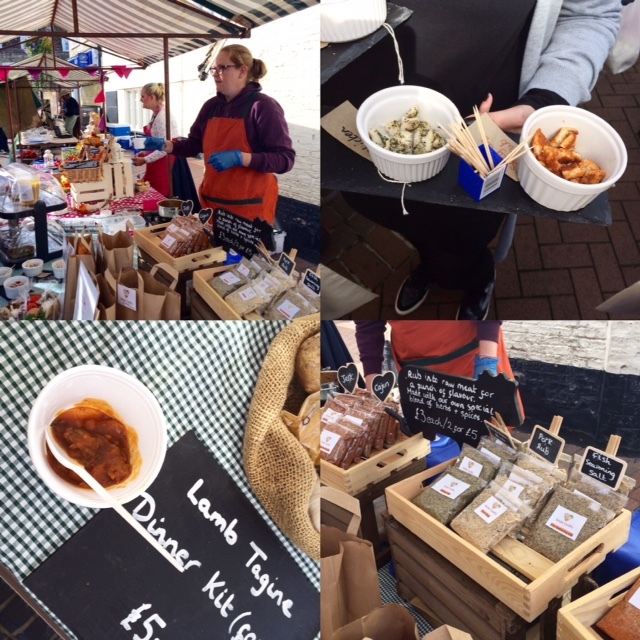 On 24 September 2016, I had the pleasure of attending a “meet and eat” food bloggers tour of Ely Markets, organised by fellow blogger Alex Higgs who is doing some work for the markets. 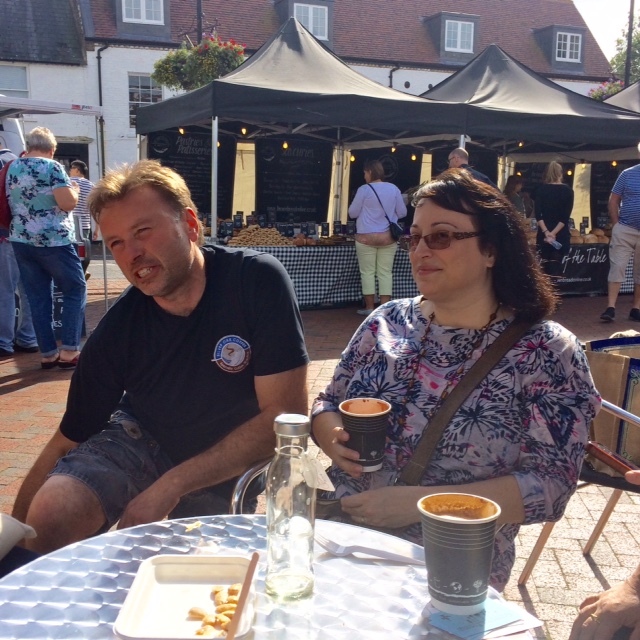 Alex was accompanied by Ely Markets representatives Julia Davis and Lisa Quin and took us on a 3-hour tour, sampling the delights of the food and farmers markets. 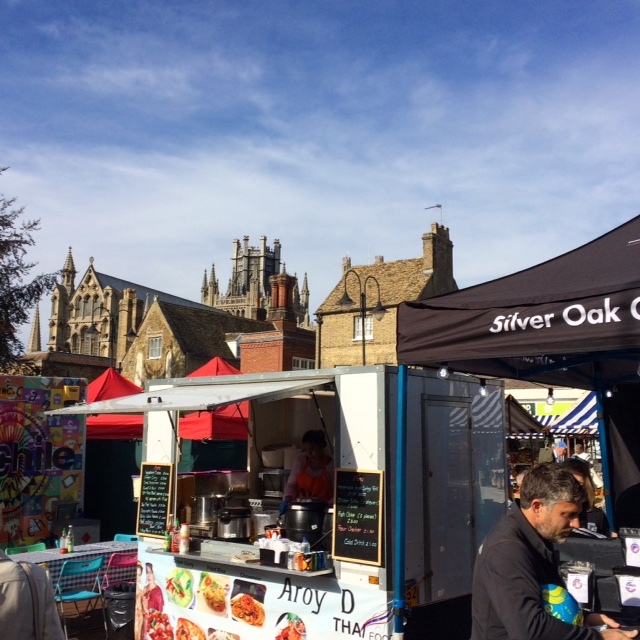 Saturdays are real foodie days at Ely Markets, especially every 2nd and 4th Saturday when they hold the Farmers Market in conjunction with the Food, Craft & Collectables Markets. 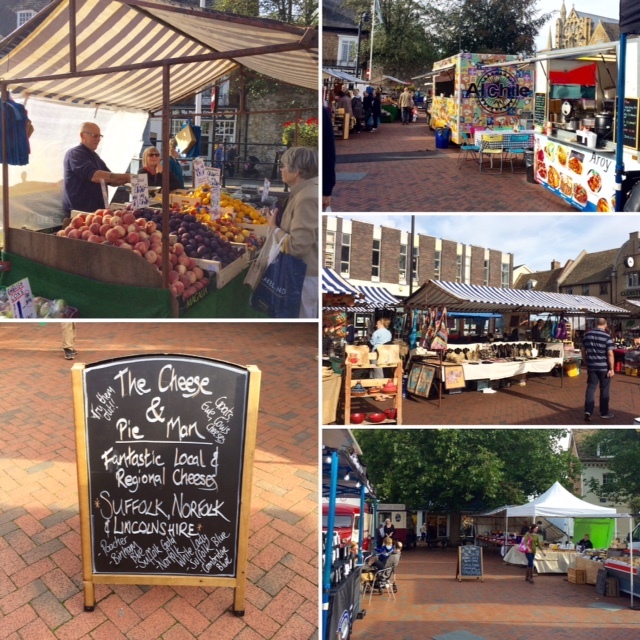 The Market Square has a food aisle every Saturday, which includes excellent street food and other food traders. I was impressed by the quality and variety of food stalls. I will definitely return on a Saturday morning to do some foodie shopping! Paulo drove me to Ely (just over a half hour drive) but the market is also easily accessible by train. Parking was so easy to find, especially in the morning. The short stay car park has free parking for 4 hours, which allows plenty of time to wander the markets. If you want to spend more time in Ely, then the long stay car park is best. We tasted and nibbled our way through various delicious food and drink stalls and by the end of the tour I was happily stuffed! 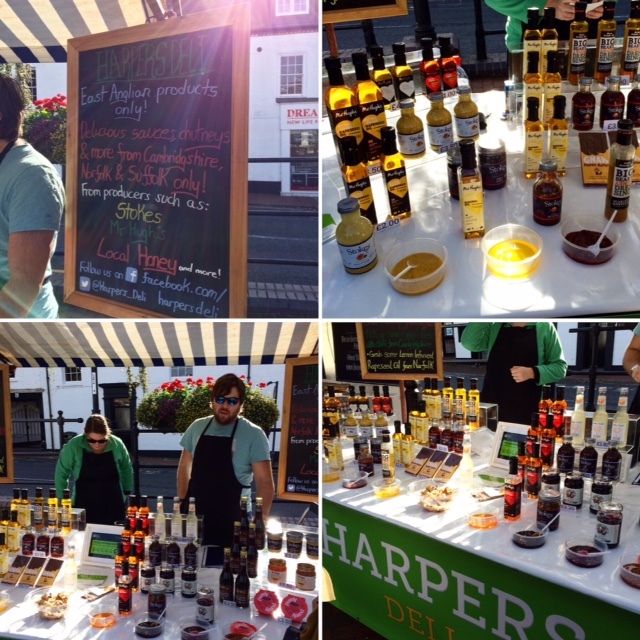 The tour began by visiting traders at the street food aisle, starting with Harpers Deli who source products from East Anglia only. It’s a great way to discover the producers right here at our doorstep. We tasted some real delights, especially Breckland Orchard’s Ginger Beer with Chilli (very refreshing, with a slight fiery tingle). It was good to meet Andrew Blundy of I Am Dumpling and hear him speak passionately about good food and keeping it simple. 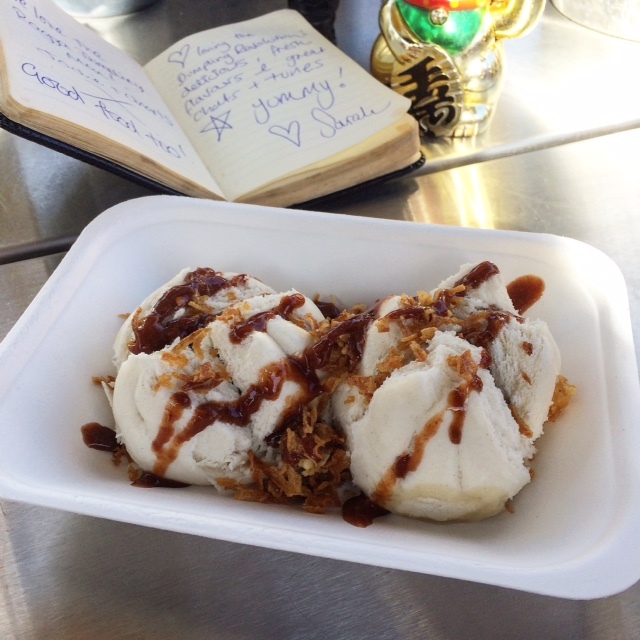 And here’s a tip for NHS employees… I Am Dumpling offer a 50% discount as a thank you for their hard work. 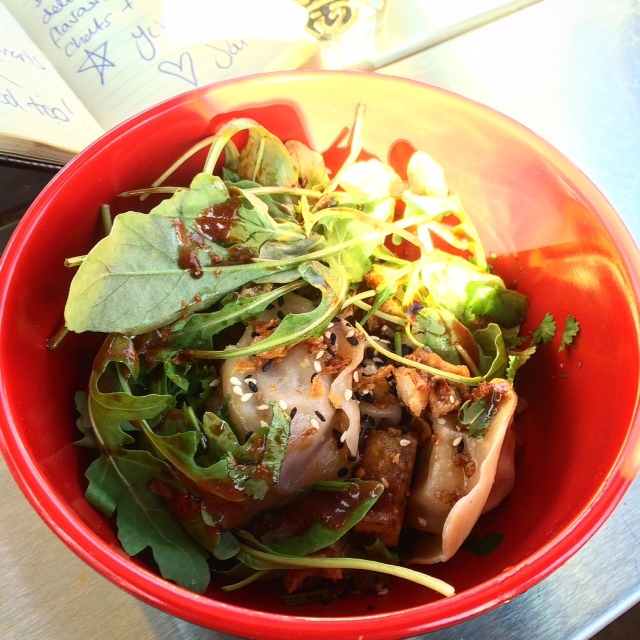 We tasted a selection of meat and veggie dumplings as well as amazing char siu (BBQ pork buns). A nice welcome to the dumpling revolution! This is going to be a regular stop at the market… Paulo even bought extra dumplings all for himself and talked about them all day! 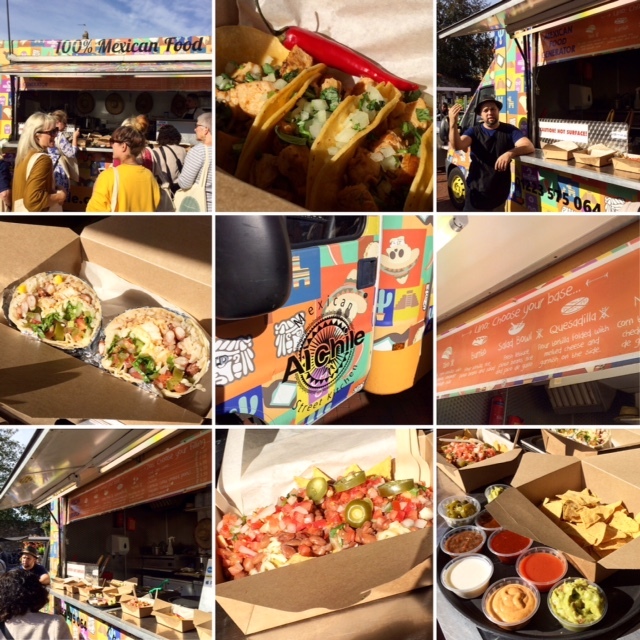 The fabulous chaps at Al Chile really spoiled us with a parade of tantalising Mexican specialities, such as tacos, burritos, quesadillas and nachos in meat and veggie options… with a selection of different dips and sauces. All of the food was so delicious and authentic. I really missed good Mexican food when I moved to the UK so I am delighted that we have Al Chile right here in Cambridgeshire. Keep an eye on where you can find their food truck, but the market square in Ely is a regular spot. Arriba! It was then time to quench our thirst and learn all about The Ely Gin Company, based in the Fenlands of Ely (how much more local can you get?). 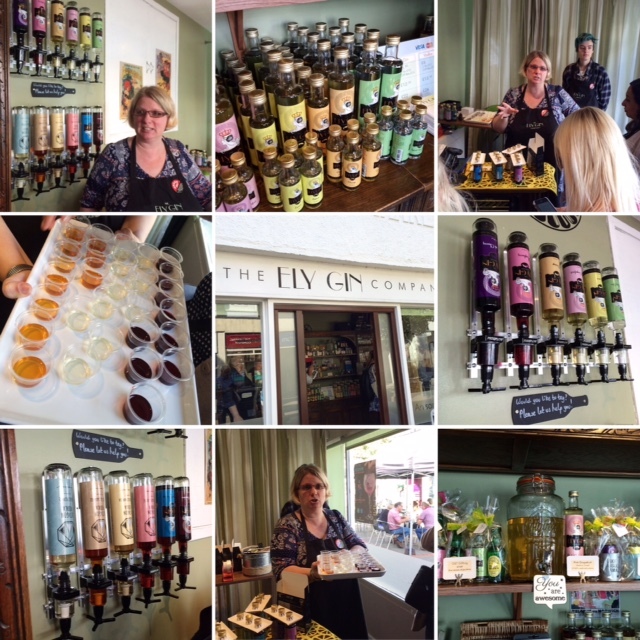 They have a stall at the market but they are so popular they also have a little shop, which was the perfect place for Nancy to tell us all about their flavoured gins and Octagon vodka… as well as taste some samples (yessss!). My favourite was the full-flavoured and medium-sweet Pink Grapefruit gin. We took a slight detour to the adjacent Farmers Market where we visited the stall of George’s Bakery. 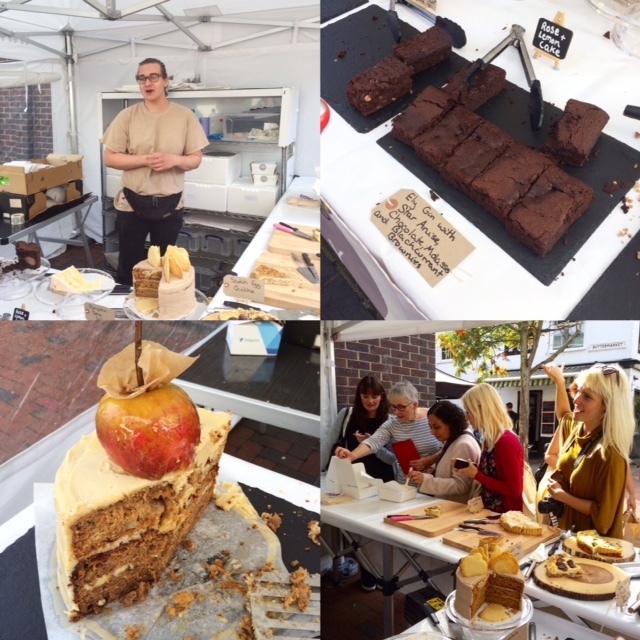 We sampled some of George’s cakes, quiches and brownies, particularly the brownies made with Ely Gin Star Anise. Next up was Food! By Lizzi, a purveyor of wholesome vegetarian and vegan cuisine. 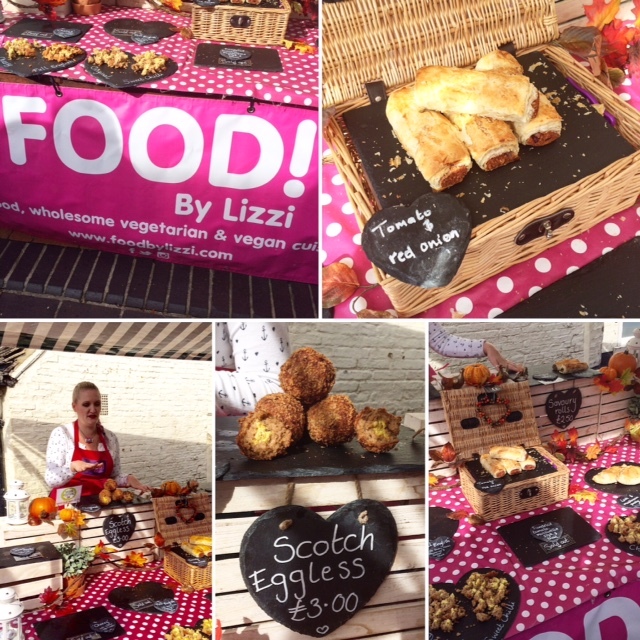 I thought Lizzi’s vegan scotch egg, cleverly named Scotch Eggless, was rather good. I still prefer my scotch eggs with egg but this was a delicious alternative. We visited the stall early on and Lizzi had already almost sold out of everything, which shows there is a definite demand for good vegan food in Ely. In fact, Ely Markets will be hosting the Ely Markets Vegan Fair on Saturday, 29 October along the High Street from 9am to 3pm. 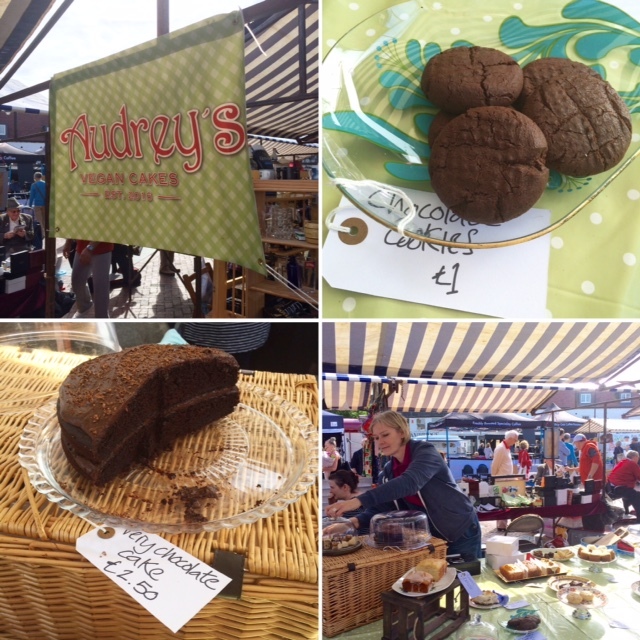 Another excellent vegan trader was Audrey’s Cakes, located in the Craft Market. Her vegan cakes and bakes were delightful. Her Very Chocolate cake was phenomenal! 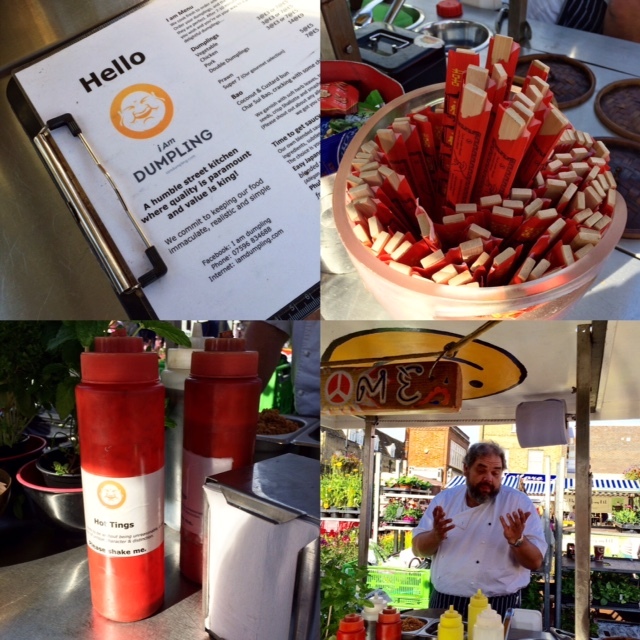 At the Farmers Market, we stopped by Simply CooKit who make meat rubs, seasoning mixes and dinner kits. We sampled some lamb tagine, which was delicious and can be easily prepared from a handy dinner kit. Time for more cake! 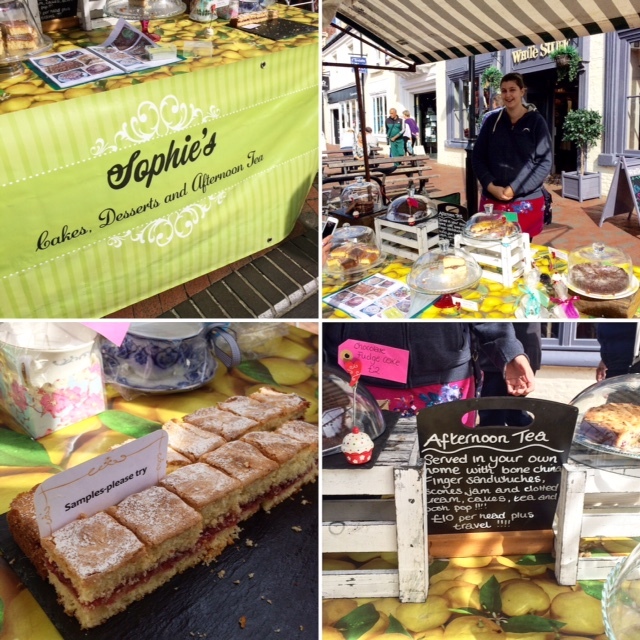 We visited Sophie’s Cakes and indulged in some scrumptious samples. Sophie makes cakes for any occasion and can also provide a traditional afternoon tea in your home. We visited Bettys Farm and listened to Matt speak about their rare breed pork sausages. The pigs reared by Bettys Farm are a mixture of Saddleback, Gloucester Old Spot and Large Black, with a few KuneKune New Zealand Breed pigs. They also rear a selection of traditional poultry, including ducks and turkeys. All of their produce is reared and processed in their own butchery on site. We tasted their traditionally made black pudding as well as their homemade pork scratchings. 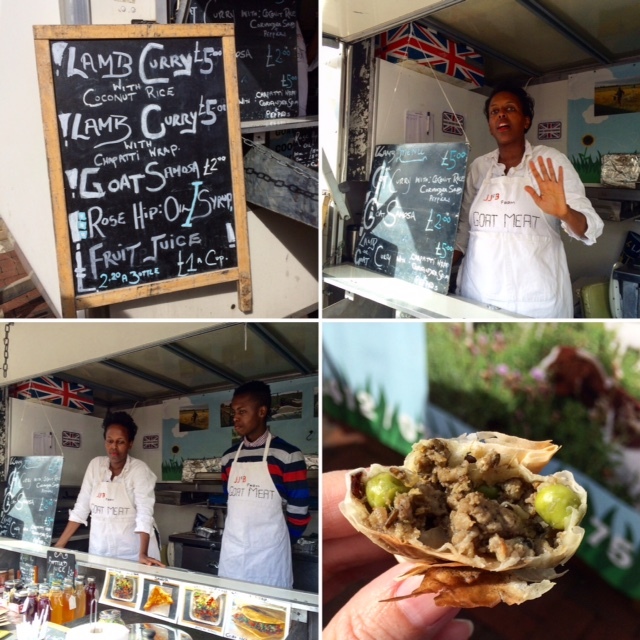 We tried goat samosas at JJEB Farm where Janet, known as the Goat Lady, told us that the free range goat meat is naturally reared and fed on their farm in Lincolnshire. 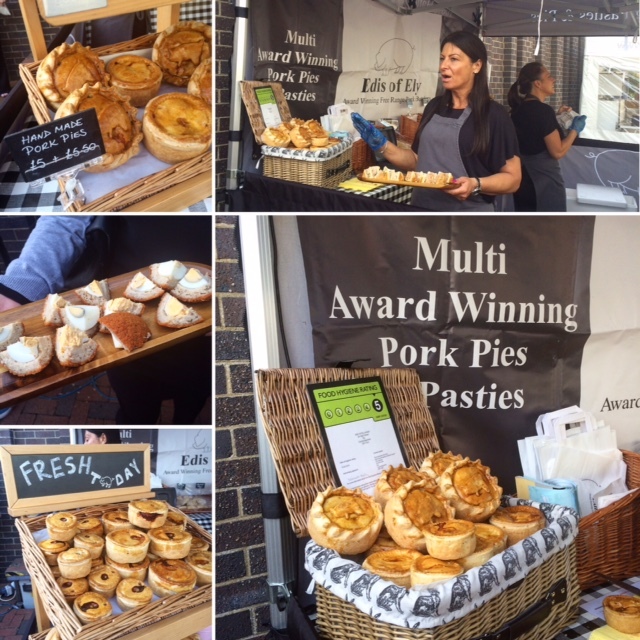 We couldn’t resist stopping by the stall by Edis of Ely and sampling their delicious scotch eggs and multi award winning pork pies. I heard their sausages are amazing so they’re definitely on my shopping list for my next visit. It’s good to see that Azahar now have an eye-catching food truck. Guillermo offered us samples of his Spanish delights, such as tortilla, gordal olives, almonds and bocatas (sandwiches served on artisan bread). 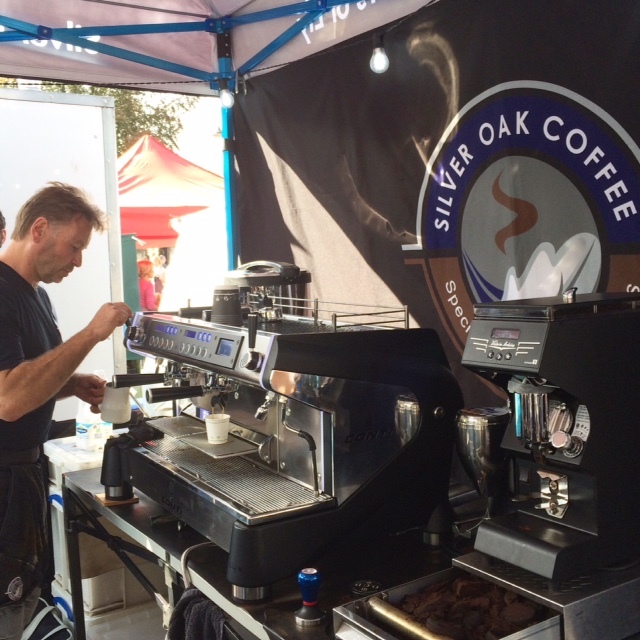 Our last stop was Silver Oak Coffee where we sat and enjoyed their excellent coffee and award winning hot chocolate. 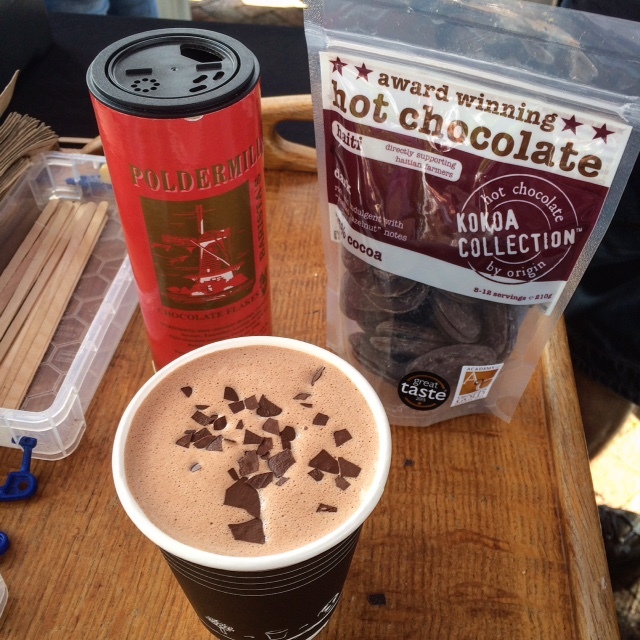 It was one of the best hot chocolates I ever had, made with single origin chocolate from Haiti and sprinkled with high quality chocolate flakes. And it wasn’t scalding hot! It was a real treat for owner Bruce Garside to sit with the group and tell us all about Silver Oak Coffee. 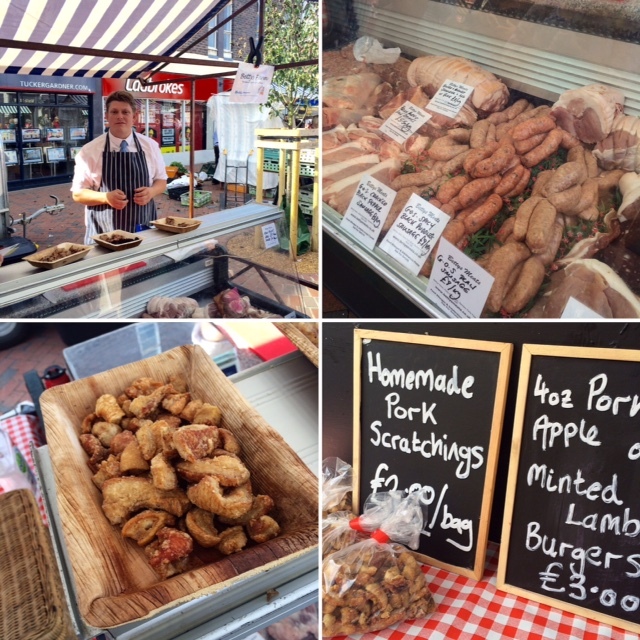 The business started over 3 years ago at Ely Market. At first they just sold coffee beans but as Bruce’s coffee expertise grew, they started brewing their own. Bruce spoke so passionately and knowledgeably about coffee, I decided to give him the challenge of getting a coffee-hater like me to try some. 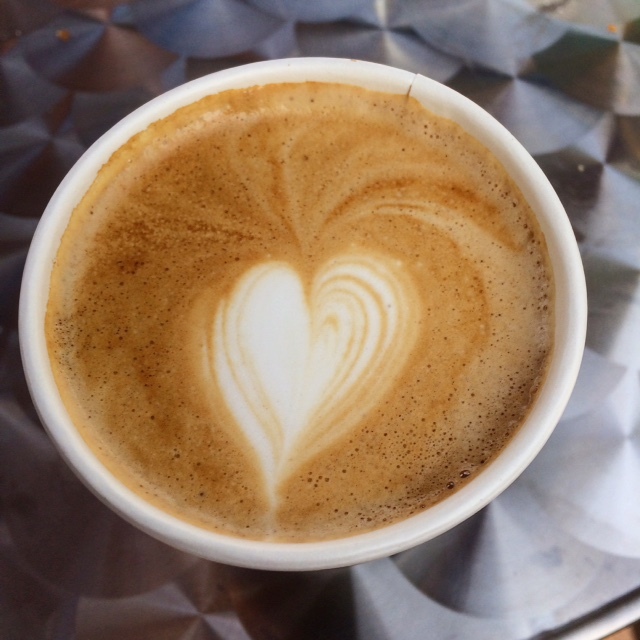 He knew exactly what to do and offered me a Brazilian coffee that was smooth, nutty but not too complex. A single shot with lots of milk… and guess what? I liked it! I can now see myself slowly getting initiated into the world of coffee appreciation. I thoroughly enjoyed the tour of Ely Markets and loved meeting all of the traders and producers who are so passionate about what they do. It was also nice to get together with fellow foodies and bloggers. 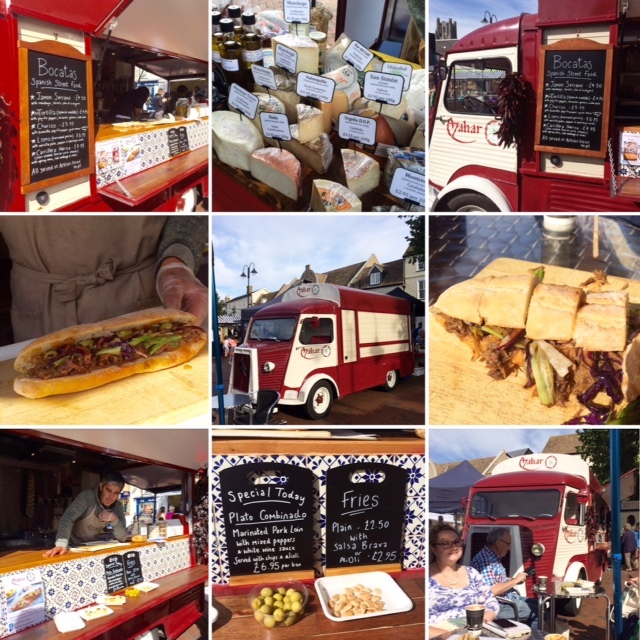 Now that I’ve experienced the markets for myself I will definitely be making more foodie trips to Ely! There is so much more than what I’ve written about here. Go and see for yourself! 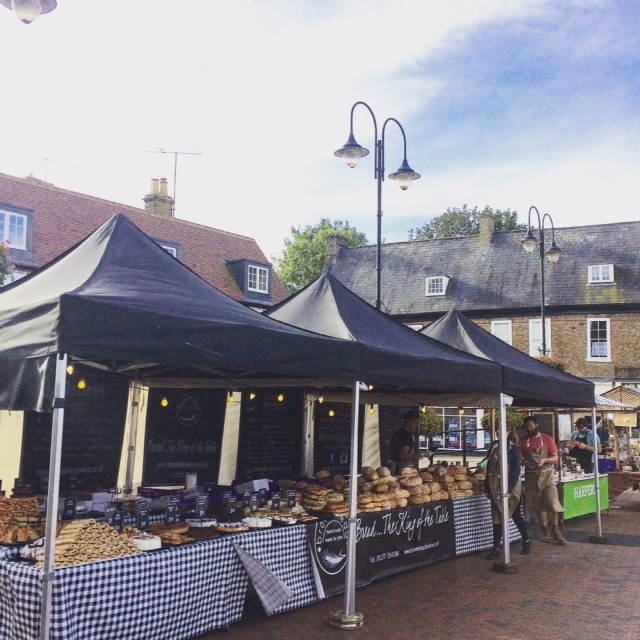 Visit Ely Markets every Thursday and Saturday for foodie delights. There is also the Farmers Market every 2nd and 4th Saturday. 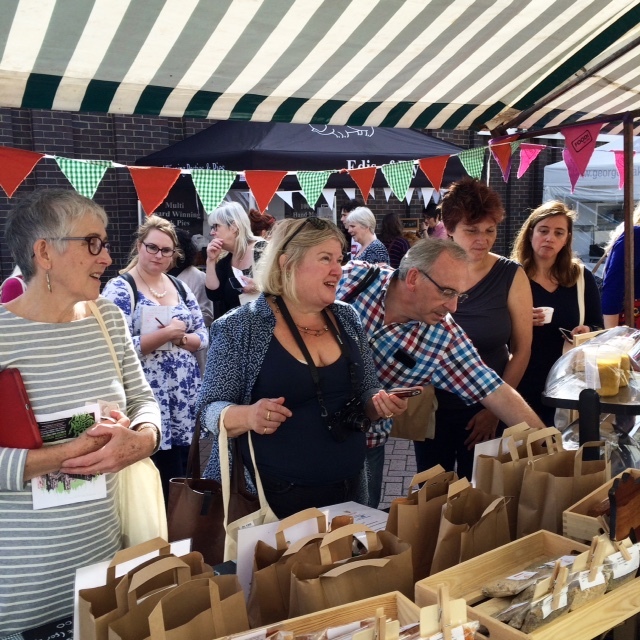 The market also runs on Sundays and Bank Holiday Mondays. Check the Ely Markets website for more detailed information. Ely Markets invited me to attend the tour. Although the food was complimentary, all views are my own. I did not receive compensation for my review. 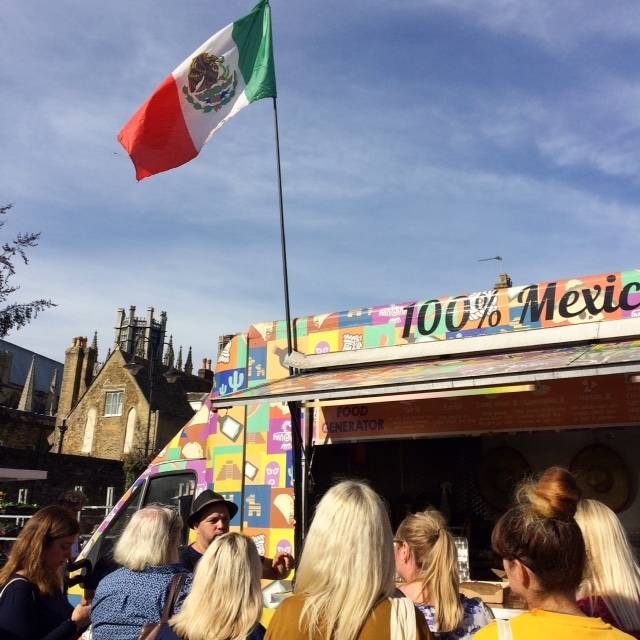 This entry was posted in Food Events and tagged Al Chile, Audrey's Cakes, Azahar Food Van, Bettys Farm, Cambridgeshire, Ely, Ely Gin, Ely Markets, Food! By Lizzi, George's Bakery, Harpers Deli, I Am Dumpling, JJEB Farm, Silver Oak Coffee, Simply CooKit, Sophie's Afternoon Teas and Cakes, The Ely Gin Company by One Two Culinary Stew. Bookmark the permalink. Great post Pina and your photos really sum up the morning. We’ll definitely be going back. Thank you, Gina. It was good to see you!